Angela Rees, is in charge of the Ty Newydd care home in Roath, Cardiff, which cares for a small number of women aged 18 to 65 with mental health issues, and is known as an effective leader who is keen for her staff to progress so they can maximise the help they give to clients. It is this dedication to her job which saw Angela honoured twice at the 2016 Wales Care Awards held to recognise people who have the X-Factor in social care. Opera singer Wynne Evans, famous as Gio Compario from the Go Compare TV adverts, was master of ceremonies at the glittering presentation evening in City Hall, Cardiff. Angela,54, who lives in Bridgend, first won the bronze award in the Nurse of the Year category, sponsored by Ontex UK, before going on to be presented with the coveted Dignity in Care Award, sponsored by the Welsh Government, a special honour which goes to a person who has demonstrated compassion and real understanding for the needs of others. Angela spent many years working as a qualified mental health nurse before moving into home management and now works for Integra Community Living Options, who have a number of care homes across South Wales for adults aged over 18. Originally from Aberdare, she began her training as amental health nurse at the age of 18 at the Whitchurch Hospital in Cardiff, qualifying three years later, and has spent her entire career in the either the health or social care sectors. After qualifying she spent a few years working as a staff nurse at various hospitals run by the former Mid Glamorgan Area Health Authority, with spells at various times in acute, long-stay, rehabilitation and day units as well as doing some community-based work. Angela has been married to her husband Paul, 58, for 32 years and the couple have two sons and a daughter. She said: “In the year 2000, when the children were a little less dependent, I thought it was time to concentrate a bit more on my career and decided to go into independent health care. “I joined an independent company as a staff nurse at one of its medium secure hospitals. “With the same company I later became a deputy manager and then the registered manager of one of its secure hospitals just outside Cardiff. “Subsequently, I did a short period of agency work which provided me with valuable experience in honing my clinical skills. Angela added: “The aim is to prepare people for independent living, eventually moving into their own flats supported by a social worker. “We currently have two clients with us, a third client currently transitioning to us from a secure hospital and there is also a waiting list for women to join us. “We have a total of 11 staff who have a range of experience, including one member of the team with expertise in housing, which is invaluable when it comes to helping people to move on into their own homes. Describing the kind of transformation possible for clients at the home with the right support, Angela said: “We had one client who had been in secure accommodation for some years but had always wanted to work as a volunteer in a charity shop. 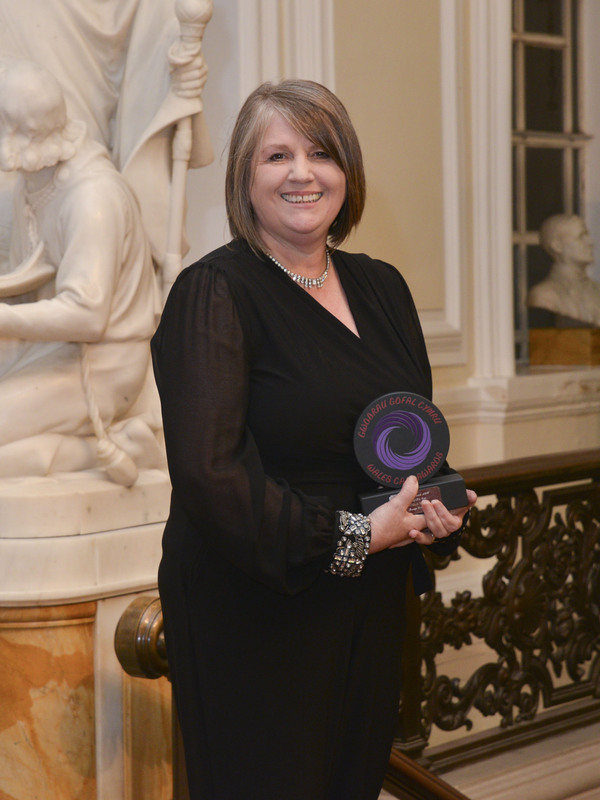 Of her double success in the Wales Care Awards, she said: “I’m honoured and delighted to receive these two awards in recognition of being part of an excellent team at Integra working together to achieve positive outcomes. “Thanks to my colleague who nominated me and all who supported me. “It was a wonderful evening and an opportunity to meet with other award nominees and representatives of all the social sector.